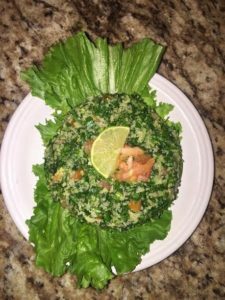 Tabbouleh is a traditional Middle Eastern vegetarian salad made of finely chopped parsley, diced tomatoes, crushed mint, fine bulgur (burghul), chopped green onions, extra virgin olive oil, lime/lemon juice, and salt. 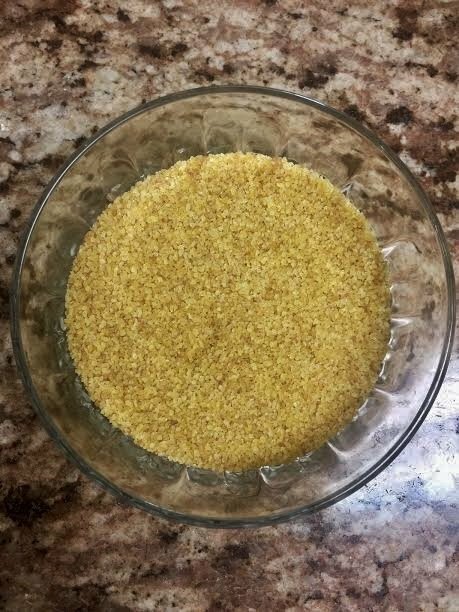 Burghul is an alternative form of bulgur. Bulgur is a whole grain made from precooked and dried wheat, which makes bulgur a tremendously healthy fast food for quick side dishes, soups, or salads, such as tabbouleh. Health fact: Bulgur has more ﬁber than quinoa, oats, millet, buckwheat or corn (Source: wholegrainscouncil.org). One of the many aspects of being in this profession is mentoring future registered dietitian nutritionists. I had the privilege of having Nora Zamzam intern with me and she shared her traditional family favorite recipe. Bon Appétit! If you like visuals, watch the video below. Squeeze juice of 2 limes/lemons onto bulgur (burghul). Set aside to soak (for a minimum of 20-25 minutes). Chop 2 bunches of parsley finely and place in large bowl. Dice tomatoes and chop green onions finely. Add to parsley. Add salt and olive oil. Add bulgur (burghul) and crushed mint. Mix ingredients thoroughly. 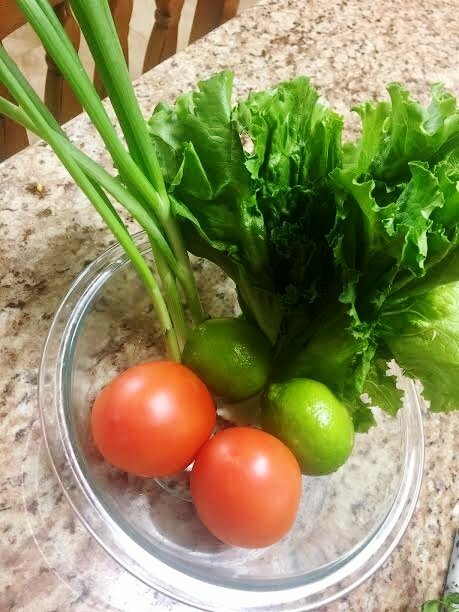 Serve alone or on a leaf of lettuce. Thanks to Nora Zamzam for the recipe, photos, and assistance in preparing the video. This is great!! Saw the video on FB!! Your student did an amazing job and its a simple recipe!! Caught my attention instantly….if you’ve never tried it before, it’s worth the effort!!!! Hi Jane! Thank you so much for your comments…yes I agree Nora did a fabulous job and I will let her now. I appreciate you saying so. Glad you enjoyed it. I love Tabbouleh salad! A very informative article. Thank you, dr Neily!